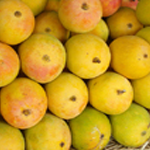 Mancurad mango is the most popular and sought after mango in Goa. This mango is primarily grown in the Konkan belt which is also famous for the Alphonso mangoes. In Goa this lone mango holds its own and beats other varieties in price and popularity hands down. It is a cousin of the alphonso and has a slight sour tinge to it. It is an extremely complex flavor and it does not throw tantrums like its more famous cousin. It is considered to be the most expensive mango in India. Its peak season is in May.